what is TPI and Durometer? Discussion in 'The Lounge' started by nauc, Jan 15, 2010.
durometer is the gauge used by tire manufacturers to measure hardness of tire rubber. I just got these cool tweed tires that match my new suit. So are you a Half Windsor or Full Windsor man ? actually, its Trigger Point Injections. the more TPI's, the easier it is for your tires to get high without significant tire over rotation but you must have a high pressure pump and an reliable regulator, do to the higher number of TPI's =ing fewer quality TPI's. Oh great, just ruin this thread with accuracy. Wait why did you ask this question if you knew the answer ? MMike put you up to it didn't he ? Stop getting so damn worried for Mtn tires..... just go with what has a good tread. Funny thing is I think that the casing makes more of a difference than tread does. Most of trails around here are hard surfaces, rocks roots and packed clay. A good supple casing that can easily conform to those hard surfaces makes for a better tire than a nice tread. I'd rather have a bald supple tire than a stiff brand new one. Different story in sand, loam or mud. I don't want to ride crappy tires. Those Ignitors in a 2.2 or 2.3, whichever it is, works pretty well around here. That's for the high thread count tires. 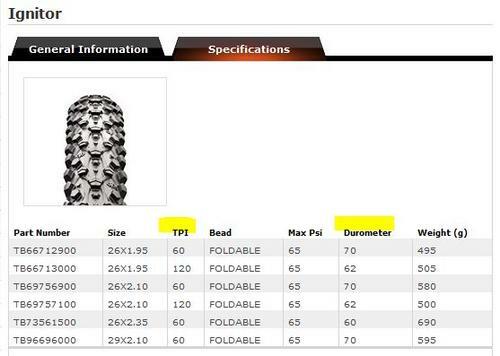 I only made that statement because for the most part, Mtn tires are either 60 or 120... difference "Usually" is ust or tt. I agree though, supple is very nice if loose rocky surfaces. For the most part, I really only look at TPI for the roadie, My favorite tire for generall use is the Vittoria Diamonte, 220 TPI..... Damn good feel to it. Those last me less than 500 miles in the back. I just ride Open Corsa EVOs if I'm going to Vittoria. They ride better and last just as long as Diamantes, for whatever reason. I stick with Vredstein for the most part. Supple and tacky. Threads per inch used to be pretty important for tubular road tires, the more threads the greater resistance to blowouts which meant you could run high tpi tires at high psi. dont give me no lip. i kung fu yur azz!